So, did I make a hand for myself, or did I make myself into a hand? I love ambiguity. Things are going well. Thatch is looking presentable now, but two big tasks remain: rigging him so he can assume different poses, and developing the other characters. I love the work, but it is time-consuming. There are less crashes now that I sort of know what I am doing; that’s progress, right? Thank you for telling all your friends about Free Living Organisms. I really appreciate your support! 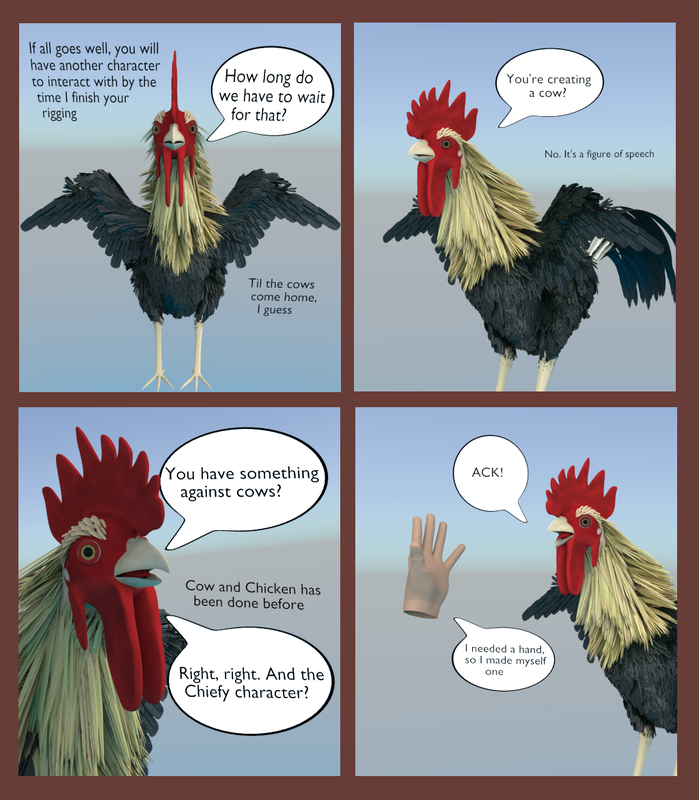 Chiefy: If all goes well, you will have another character to interact with by the time I finish your rigging. Thatch: How long do we have to wait for that? Chiefy: Til the cows come home, I guess. Thatch: You’re creating a cow? Chiefy: No, it’s a figure of speech. Thatch: You have something against cows? Chiefy: Cow and chicken has been done before. Thatch: Right, right. And the Chiefy character? Chiefy: I needed a hand, so I made myself one.